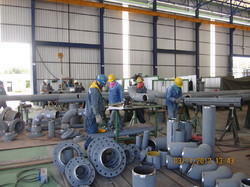 Prominent & Leading Service Provider from Navi Mumbai, we offer industrial piping - fabrication & erection. We offer unmatched turnkey solution from concept to commissioning of complete plant utility & process piping. We have extensive experience in CS, LTCS, SS, GI, PVC, UPVC & HDPE. we are widely known for erection, commissioning, servicing and maintenance of Industrial Piping’s with instruments, Pump House, Oil, Gas, Fluid Piping etc. Looking for Industrial Piping & Erection Services ?